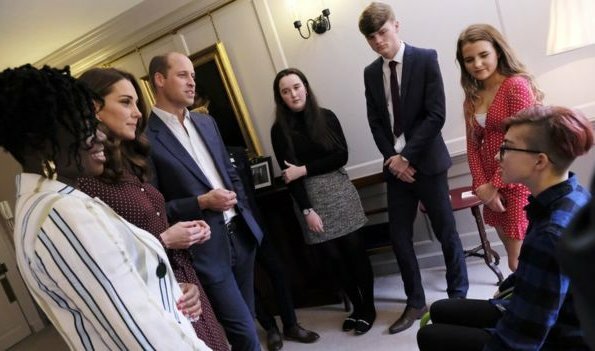 The Duke and Duchess of Cambridge invited the three winners of Radio 1’s Teen Heroes of 2018 for tea at Kensington Palace prior to this weekend's Teen Awards.They were invited to Kensington Palace together with Radio 1 DJs Greg James and Clara Amfo. 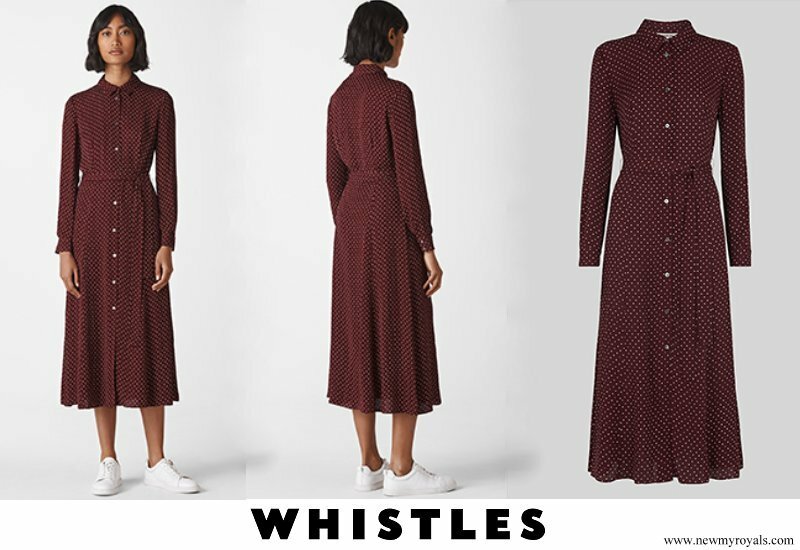 (The Duchess wore Whistles Margot Spot Shirt Dress and Gianvito Rossi pumps). The three teenagers who are the winners, Lily, Siena and Junior, will be awarded their prizes at Wembley Arena and artists including Little Mix and Liam Payne will perform there.Lily, 14, is a wheelchair motocross competitor and advocate. Siena, 16, works to support students with autism and learning disabilities and Junior, 14, is a dancer who campaigns against bullying. 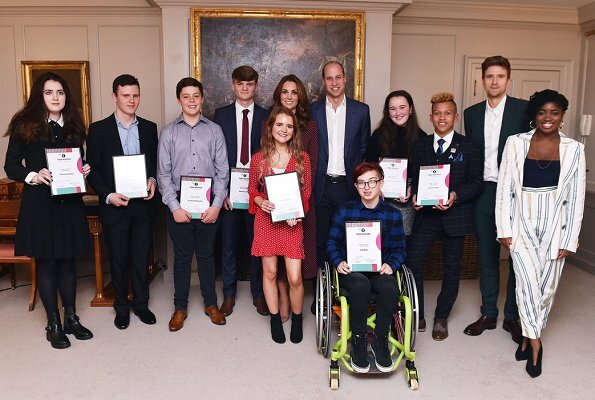 This is third year in a row that Prince William and the Duchess invited the Teen Heroes to Kensington Palace. What a nice event. Young Heroes Award is something special. Nice simple dress the focus is and should be on the young people. 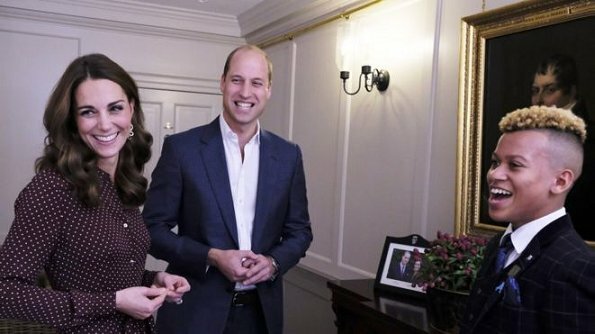 Dss Kate and William look happy. They both look wonderful! Classy without breaking the bank, and allowing the students to be the focus of attention. Kate is so gracious, she’s a hard act to follow. For one thing, this setting is a private event/ invitation to the teen heroes so the focus should really be on them. Also, Why is there a need to say that Kate is a hard act to follow? Why is there a need to set Kate as a standard or point of comparison? I mean, one can shine on her own. Every person is unique and different. It was not my intention to compare the Duchess to anyone else. I personally believe that she is a hard act to follow. Yes, she is indeed a hard act to follow and does set a high standard. Kate looks ready for a cosy autumn. What I don't understand: this is a simple, but elegant and beautiful dress, why is the model wearing white sneakers? Those shoes do not look good! Yes, those shoes ruin the spirit of this dress. She looks happy and friendly but the color of the dress is not the best for her. It makes her look a little bit pale. I would love to see her wearing trousers for a change in this type of occasions. I really like Kates style. I don't like this dress. It looks like one my grandma would wear and she is 77. But it's great to see this nice couple. J’ai 73 ans et je ne porterais pas une telle robe ,surtout aussi longue ce qui la rend très triste .